Today I'm excited to welcome Janet Fox, author of the debut novel, Faithful. I just started reading it--and I'm hooked! If you want a chance to win your own copy, please leave a comment below. My worst breakup was my own dumb fault. I had a steady guy in high school that I really connected with – he was tall, dark, handsome, and smart. When he was a senior and I was a junior I broke up with him, just because I wanted to date other guys for a while. I regretted it so fast; but by then he’d been so hurt he not only moved on, he wouldn’t even look my way. Ouch! Years later we reconnected. I was thrilled until he dumped me. Double ouch. Years after that, he had a heart attack and died very young. I still feel terrible – like there’s unfinished business out there. Even though I’ve married my true love (and yes, he’s tall, dark, handsome and smart), I think sadly about Mike from time to time. Janet Fox currently lives in College Station, Texas, with her husband and high-school age son. But her heart is in Montana, where the family has a cabin in the mountains not far from Yellowstone. Her work has appeared in Highlights for Children and Spider magazine; her non-fiction middle grade, Get Organized Without Losing It (Free Spirit Publishing, 2006), continues to be a top seller. 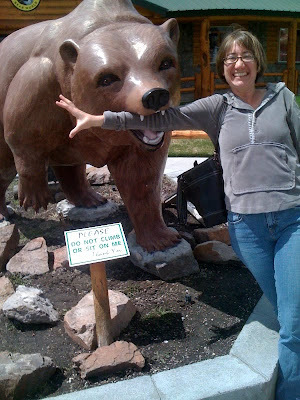 She is an MFA student at Vermont College of Fine Arts, and an ARA for BV-SCBWI. She is currently working on a sequel to Faithful, in addition to several other projects. Please leave a comment by midnight on Monday, May 31, 2010 to win a copy of Faithful. Hanging Out At Teens Read Too. Hi Everyone! Just wanted to let you know that I'm hanging out at the Teens Read Too Book Club blog. 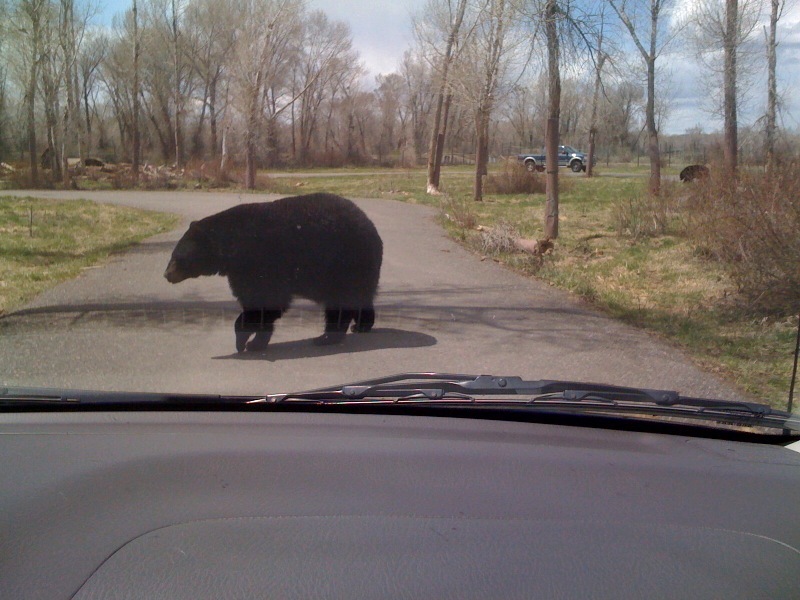 Revision Is A Bear! Or Is It? And it wasn't too effective. My manuscripts gathered a stacks of rejection form letters from publishers. Eventually, I learned the importance of revision, but I still didn't have many effective tools for approaching it. I simply read through my manuscripts over and over again, looking for things to fix. And sometimes I couldn't see the problems through the, um, car windshield. Earlier this month I had the opportunity to attend Darcy Pattison's novel revision retreat. Aha! Using Darcy's workbook, Novel Metamorphosis, we learned how to tackle revision issues one at a time. First we created a novel inventory, noting the plot action and emotion in each chapter. So helpful! At a glance, I noticed a potentially weak chapter and places where I could strengthen emotional resonance. Another incredibly useful revision technique is the shrunken manuscript. Darcy showed us how examining our novel in 6 point font, single spaced, can show us the overall patterns in our stories. One attendee realized that her story lacked conflict for several chapters in a row. That's exactly the kind of comment I used to ignore (my critique partners just didn't get it, I'd tell myself). But it's hard to argue with bright, bold highlighting. To learn more about the shrunken manuscript process, check out Darcy's blog. All weekend we worked on small sections of our stories, which made the process seem quite do-able--and not quite so scary or overwhelming. Because revision really isn't a bear, it's simply a series of small tasks. 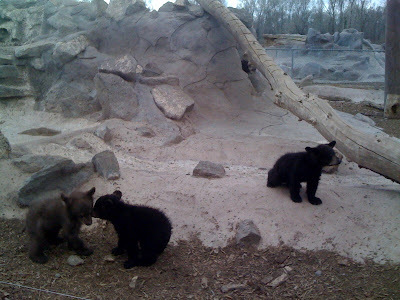 Think of them as cuddly little bear cubs! I'm going to state the obvious: there is no way to stop people from talking about us when we're not there. We are just too interesting! And most of us give in to the temptation at least now and then to take a little bite out of someone else's hide. It makes us feel better about ourselves to point out our superiority over other people, even people we like. Both of your friends have played a part in this scenario. One of them said it and one of them repeated it to you. However, you've got to give credit where it's due. That was a nice bit of snarkiness. She didn't actually say you looked bad in your clothes, just that she would look even better! But that was enough to start your own personal doubting voice. If you will listen carefully, you will detect a rather unpleasant chatter in your mind. It's negative, pretty extreme, and usually starts with YOU! It's not true stuff, but an accumulation of put-downs you've heard along the way. What I'm talking about is the "Your hair is such a mess; you look awful!" kind of chatter we tell ourselves. That's you being hard on yourself. It feels bad and IS bad for us. For one thing, your friend doesn't ever have to say those things again, but you may say them to yourself another thousand times. And feel bad all over again--a thousand times! The real answer is to stop going off on yourself! And think about why that person said what she said. Is she struggling to feel OK about her own appearance? You could think, "Yeah, my clothes would look cute on her too, because they're cute clothes!" Or, "I like my hair, and it looks pretty much like everybody else's." You know that old saying about not judging a book by its cover? Well, my shelves are full of books I bought simply because I loved the cover. 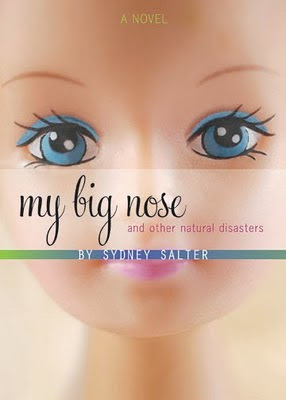 And I've heard from many people who have bought my book, My Big Nose And Other Natural Disasters, simply because they loved the cover. Today I'm absolutely thrilled to announce that the great design team at Houghton Mifflin Harcourt has won the Novel Cover award at the Bookbuilders of Boston 53rd Annual New England Book Show for My Big Nose And Other Natural Disasters. Yay!!! Congratulations to Carol Chu, the book's designer, Diane Varone, production and manufacturing coordinator, Sheila Smallwood, art director, and my editor Julie Tibbott. Authors don't have much say when it comes to book covers, but I've always been more than happy to put my stories in the hands of the capable design staff at Houghton Mifflin Harcourt. So, go ahead, please judge my books by their covers! During our spring vacation, I flipped out of a river raft in a Class IV rapid. I held on to the thin safety cord attached to the raft with a grasp so intense that my pinkie finger was numb for the next ten days. And I injured my shoulder. It all happened so fast; I didn't know whether I'd smashed my shoulder against a rock, or tore it up by hanging on. Thus, our family debate. Over the years, I've hung on to a lot of things when I should've let go: not-so-good relationships, dead-end jobs, unrealistic goals...and a cute skirt that never quite fit. The thing is: deep down I knew I needed to let go of the relationships, the jobs, the goals, and even that skirt. But I didn't trust my intuition--you know that feeling that pricks your gut, whispers in your mind? Eventually, things reached the point that I absolutely had to let go--of the relationships and jobs and goals that simply didn't work. I also--finally--gave the skirt to a friend, and it looks great on her. 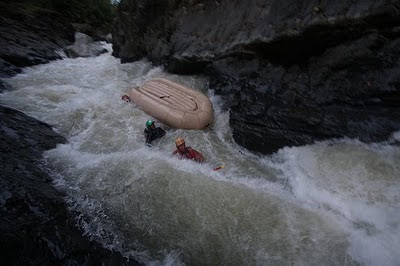 So back to the river raft: I did trust my intuition. I knew I wasn't a strong enough swimmer to escape a Class IV rapid, so I held on. And I didn't regret my decision--even if it meant surgery. Last week, I was happy to learn that I broke my acromion bone (the very top of my shoulder) by smashing against a rock when I flipped out of the raft. No torn muscle, no surgery! Holding on didn't hurt me this time, but I still think it takes more courage to let go.